I have been a happy user of SPDs for years, but there are some times when I want to be unclipped – such as steep technical climbs at slow speeds. Conventional SPD pedals don’t allow for anything other than being clipped in, so step forward the Trail SPD pedal, which feature a cage around the normal SPD pedal. 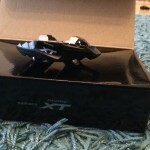 Excellent pedals for those who want to stayed unclipped every once in a while with little weight penalty.